Sonny checks in on Alexis and tells her that he&apos;s glad that she&apos;s okay. Alexis says she won&apos;t be charged with anything and is upset with her life choices. Sonny is certain that she&apos;ll rise again and tells her to give herself a break. Sonny commends her for being brave and taking Julian down. Alexis is just glad that Julian will now be behind bars. Hayden admits to Tracy that she doesn&apos;t want to be Finn&apos;s drug mule because of her own legal issues. Tracy declares that she&apos;ll go by herself. Meanwhile, Finn&apos;s tearing his room apart looking for some extra doses that may be hidden. Liz finds out that Franco signed up Jake to an art camp that costs a couple thousand dollars. Liz reminds him that she has two other sons and no money to pay for various camps. Franco apologizes for jumping the gun. Liz says she appreciates what he&apos;s done for Jake. She reminds him that she has boundaries and he needs to back off. Nina&apos;s thrilled with new hire CJ until she finds out that she&apos;s actually Claudette. CJ claims she wanted the job on her merits and not because of Nathan. Nina fires her, but Maxie steps in to stop it. Maxie speaks with Nina and tells her not to give CJ grounds for a wrongful dismissal lawsuit. Nina doesn&apos;t understand why Maxie would want Nathan&apos;s ex around. Maxie says she doesn&apos;t trust her and wants to keep an eye on her. Nina talks to CJ and apologizes for overreacting and offers her the position. Nina then speaks with Curtis and offers him an investigation position for an upcoming article. Curtis agrees and also offers to investigate CJ. Tracy and Hayden meet with Finn and let him know that Hayden isn&apos;t willing to get the drugs for him, but Tracy is. Finn refuses, saying Tracy is still recovering from her health scare and doesn&apos;t want either of them to risk it. Tracy tells him that thanks to her marriages, she has underworld connections and can get someone to pick up his drugs. Finn finally finds one of his samples. He kicks them out, but not before Hayden picks up something off the floor. Liz talks to Epiphany and asks her not to schedule her on the same days that Franco is working. Liz admits that Franco has overstepped his bounds and she wants to nip in the bud. Franco overhears and later tells Pif that there&apos;s no point in him being nice anymore. Oh Franco, grow up already. You signed up someone else&apos;s kid to an expensive camp without her knowledge and she slapped you down for it. Pull up your big boy pants and accept it. CJ tells Maxie that she&apos;s just here to do a job. She wishes the best for Nathan, without a hidden agenda. 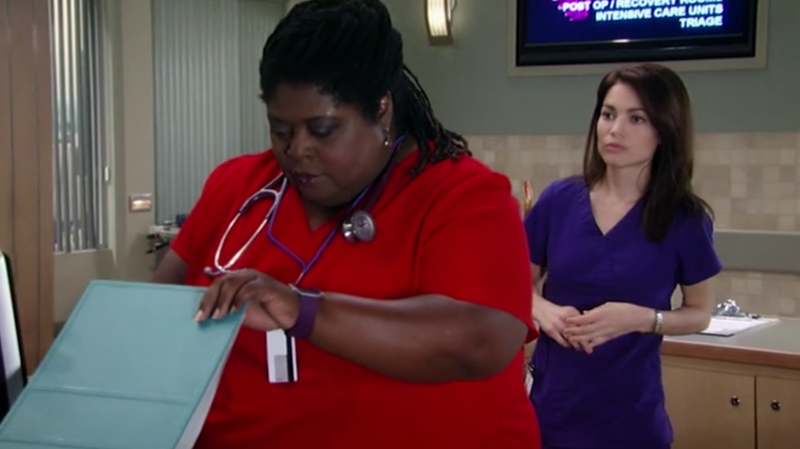 Hayden shows Tracy that she found an invoice for the drug that Finn needs, which is zekenestrol. Hayden says she knows who can get it for her. Maxie hunts down Nathan, who&apos;s still trying to find the hospital murderer. She wants him to take CJ to lunch. Alexis checks her calendar and realizes something. It better be that she hasn&apos;t bought chocolate ice cream in awhile and not that she&apos;s really pregnant. Franco gets on the elevator with Liz and evilly stops it.